Nestled behind the monumental California Redwoods lies Mad River Brewing. 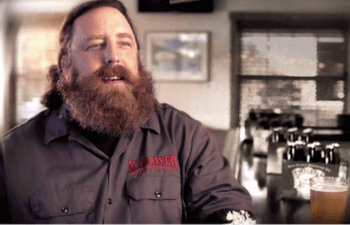 We had the opportunity to sit down with their brewmaster, Dylan Schatz, to ask him about his story with Mad River Brewing. We like to back up a little bit in time. Before you were interested in beer or brewing, what were you doing? Dylan: Way back when, I did a bit of restaurant work and played around in the kitchens. Before I wind up at Mad River, I moved on to construction. It was basically myself and one other guy building houses from the ground up. He was a contractor. He wanted to take a year off. I did his job and wind up at Mad River. You’re swinging a hammer and cutting boards, and then something happens. You get introduced to craft beer or how…? Walk us through that transition from this construction guy to a brewer. Dylan: [laughs] At the time, I was also doing a lot of rock climbing. One of my main partners worked at Mad River, a maintenance guy. Anyway, he knew I was looking for a job, woke me up one morning, said two people just left. What is it you like about making beer? Dylan: It’s the creativity of it. Going back to restaurant days, I do love to cook. I still do. I love to play a round with ingredients, so having that flexibility of creativity is what really keeps me going on it. Why does Mad River make beer? Dylan: Because we love to. We like local handcrafted products in our area. [inaudible 4:07] is very big on being local supported, and we have fun with it. We like what we do. It’s a lifestyle. How does your community down there relate to that local aspect and that handcrafted element? Dylan: Very well. We have a very large number of local small artisan food and beverage producers here. We’re very well supported by the local community. What’s different about Mad River? I remember working with some of your top handles a while ago and as we are putting your beer on… It took me a while to realize that it’s like two different brands were actually one company, the Steelhead and Mad River. I looked it up, and I go, “They have the same address, what’s going on here? Dylan: That has been a point of confusion over the years. Recently we went through full re‑branding to basically address that issue. Steelhead Extra Pale Ale is still Steelhead, that’s what people think of. Jamaica Red Ale is still Jamaica Red. All the other beers have got different names and different artwork. Steelhead Double IPA is now Slammin’ Salmon, Steelhead Porter is now Unitown Porter, Steelhead Stout is now Redwood Stout, and then what used to be Jamaica Sunset IPA is now simply Mad River IPA. What’s the story of Steelhead Extra Pale Ale? Dylan: It goes back to early craft days. It was before I started here, obviously. But pretty much what we were looking to do is create a nice, light everyday easy drinking beer that was very approachable to a lot of people. The pale ale style, but lighten it up a little bit. So we call it Extra Pale Ale, which style‑wise is more of a golden or blonde ale. As far as the name goes, we’re literally 50 yards away from the Mad River here in Blue Lake, and we were very well known for steelhead fishing in this area. We have a salmon hatchery just up the road from us as well. How did the Jamaica Red Ale came to be? Dylan: That one, basically there’s a very well‑known reggae festival that happens annually in Humboldt County. It’s called “Reggae on the River.” A long time ago, they approached us at one point to brew a beer for that festival, and that’s what we came up with. That’s the Jamaica Red Ale. Tell us a little bit about your brewing team. You’ve got a whole nice tight of group of guys around you. I’m sure one guy can’t do all that, and I’d love to hear a little bit about your team. Dylan: A lot of these guys have been here, our brewery especially, every single one of them has been here over 10 years. We’re a dedicated crew. We’ve got two full‑time cellar guys, and three full‑time brewers at this point. We’ve just upgraded our brew house finally. We cut one position out, however that guy was moving out to start his own brewery right about then, so it worked out there. Do you guys divide it up style‑wise, or can anybody fill in for anybody? What do you like to do when you’re not making beer? Dylan: I still enjoy cooking a lot. That’s one of my number one hobbies. Also kayaking, not whitewater, just basic lagoons. Fishing, hanging out with my son, watching him grow up. Tell us something on the inside, that someone would have to be there to really know about. Dylan: I would say we’re the most highly functional dysfunctional family you’ll ever meet. We have lots and lots of very, very old equipment here. A constant part of our week is, what’s going to break today, and what are we going to fix on‑the‑fly? It’s all very adaptive. We make do with nothing. We had a Glenco chiller that went down a few months back, and we managed to keep that fermenting tank chilled using pretty much every jockey box we had, blocks of salt, ice water, whatever we do to keep that tank from getting away from us. Whatever works. How big was that thing? Dylan: That was a 100‑barrel fermenter. We had some very dedicated guys who spent the night here changing out the ice water bath. We managed to get through, and save the tank. We needed a new compressor on it. This thing went down in the afternoon, we wouldn’t be able to get one and until the next morning, so there you go. We’ve heard lots of exciting things about some goings on at Mad River. Do you want to talk to us a little bit about that? Dylan: Right now, we spent 27 years brewing on the original Sierra Nevada brew house 17‑barrel system that Ken Grossman built. Just recently, this last spring, we have upgraded so now we’ve got a four vessel, 30‑barrel system that’s dramatically increased our efficiencies, so much so that we actually maxed out our fermenter space this summer. Right now I’ve got another 200‑barrel fermenter on order. It should be here in December. We’ll follow that one up a few months after that. We’re just picking away at all the stuff, slowly upgrading all the equipment here, making it more efficient. Something we just did is we started canning our pale ale. We’re using a mobile line for that temporarily. Just to test the market to see how that’s going to go. Our next upgrade is to get our own canning line. Anything else you’d like to tell our customers? Dylan: Thank you for your support all these years. We couldn’t do it without them.